He showed the way last season, and now in 2017/18, Aubameyang wants to bring the whole of Dortmund with him. He could have moved on over the summer, but Pierre-Emerick Aubameyang has stayed at Borussia Dortmund, and last season's Bundesliga top scorer is now set to become the leader of the dressing room for the black and yellows. "It's true I spoke to Borussia before going on holiday. I told them that I thought it was possible that I would want to try something different," said the 28-year-old after packing away the beach towel and getting back to work. "But… I'm staying here, and I'm very happy about that, I feel at home here." For some, that might mean putting on the slippers and easing into a comfortable chair for the season, but not Aubameyang, cosy as he is, at the Signal Iduna Park since 2013. Fittingly for a man whose fleet of foot is legendary, he has hit the ground running at the sort of speed that means he can cover 30 metres in a Usain Bolt-esque 3.7 seconds. Though the Supercup was lost to Bayern Munich, there was a goal and a penalty in the shoot-out for Auba, who followed that up with a hat-trick in the DFB Cup as well as a strike in the Matchday 1 defeat of Wolfsburg. Normal service immediately resumed for the 2016/17 Torjägerkanone-winner, suggesting new BVB coach Peter Bosz will benefit from another hefty haul from his star striker this term. But more than just the number of goals, Aubameyang has a tendency to find the net at key moments. He scored seven opening goals last term, giving Dortmund an important footing in just less than a fifth of all their 2016/17 league games, and he was the man who delivered the coup de grace when Dortmund had worn down their opponents, plundering a league-high 18 goals in the second half, seven of which came in the frequently decisive last quarter-hour. Reus and Aubameyang have a special relationship on and off the pitch. That sort of ruthless, prolific streak will earn you the respect of team-mates and opponents alike in its own right, but Aubameyang's heavyweight status in the Dortmund dressing room is a product of more than his pure goal-scoring prowess, and makes him a crucial, binding force within the squad for Bosz to rely on. At 28, he is one of the senior members of the squad in terms of age — only four players are older — but he also commands respect as one of Dortmund's longest-serving stars. Of the regular first-team starters, only Marcel Schmelzer, Nuri Sahin and Lukasz Piszczek have played more than the 134 Bundesliga matches Aubameyang has featured in. His open, fun-loving personality means a smile is never far from his face. "I enjoy the good moments in life, and I have a lot of them," he said recently. "I am fundamentally a happy person; I always have been." That makes him approachable, and with his finger on the beating pulse of fashion, he easily and often dazzlingly bridges the gap between the senior players and the younger elements of Bosz's squad. If they want to ask a question, Aubameyang, who captained the side at times under Thomas Tuchel, has the answers having been there, done that, and worn the black-and-yellow shirt. 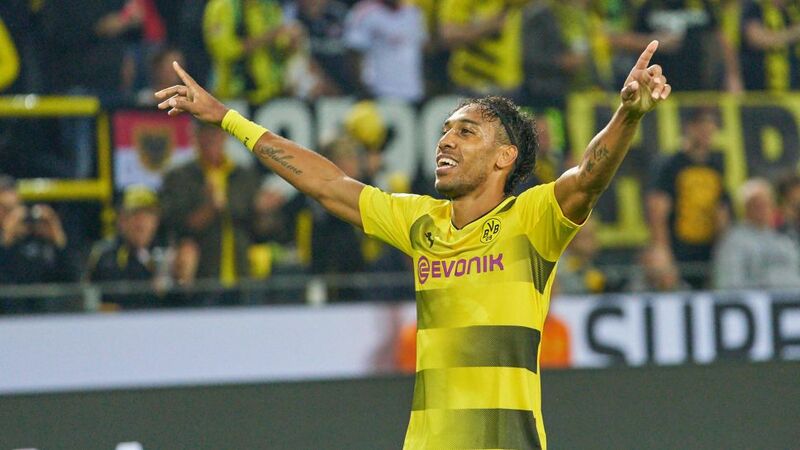 Quiz: How well do you know Aubameyang? "Aubameyang is a leader, a big player for us," said an appreciative Christian Pulisic, 19, earlier this month. "He's been great with me. I've learned a lot from him by just being around him in training and picking up small things. Obviously he's a fantastic player and it is great to have him here." Aubameyang's understanding with his team-mates, from the YouTube generation to the senior pros, clearly extends well beyond the walls of the dressing room and onto the pitch where his work ethic, determination, physical prowess and footballing skill remains as strong and inspirational as ever. "I know when it's time to work," he says, having undermined the pre-conceived ideas of many German observers, sceptical of someone who jokes around so much, a long time ago. Opponents have been on the wrong end of his on-pitch punchlines, often delivered with the help of his partner-in-crime, Marco Reus. The prospect of the dynamic duo being reunited when Reus is fit again is a mouth-watering one, while the return to form and peak condition of Mario Götze bodes well for the Gabon captain, who will surely thrive on the 2014 FIFA World Cup final match-winner's vision and ability to deliver a final ball. Promisingly, he was on the same wavelength as Pulisic against Wolfsburg on Matchday 1, sliding in to touch home the USMNT teenager's driven low cross, while he has also struck up a fruitful partnership with summer recruit Maximilian Philipp. The duo teed each other up in Matchday 6's 6-1 thumping of Borussia Mönchengladbach, scoring five of the goals between them. After hitting 31 last season, the highest-ever tally for a foreign-born Bundesliga player and the biggest haul in the German top flight for 40 years, Aubameyang is already on course to match - if not better it - in 2017/18, with eight league goals after just six games. Could that mean he is getting closer to breaking Gerd Müller's long-standing Bundesliga single-season record of 40? "We will see. I have a lot of faith in myself, but that record commands respect. What Müller accomplished is extraordinary. Forty goals - wow!" said the Dortmund striker of the Bayern icon's mark that has lasted since 1971/72. "To set a mark like that, you have to work very hard and a lot. But if I look at my games, I see the possibility to get even more goals." Bundesliga defenders, you can't say you haven't been warned!